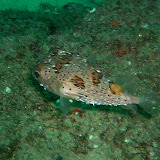 I'd love to have you post your dive log info on our site at http://www.BajaDivers.com. We're building what we hope will be the most complete source of info on diving the Baja Peninsula and we'd appreciate your contribution. BajDivers.com - by divers, for divers!